The shoulder straps are a very thin material and completely perforated. This is great for weight, and perhaps not so great for your shoulders. However, if you ever find yourself carrying enough that these straps bother you, you might be carrying too much (my guess is more than 15 lbs). There is no structure to this bag in the form of a frame, padding or otherwise. This should be fairly obvious from other reviews and the description of the bag on REI's website, but it is a consideration worth being clear about. As a consequence, the water resistant material sits directly against your back making it difficult for your the sweat there to evaporate. All that sounds like a negative review, I know -- but I really like the bag, and I like it much better than the Flash UL which it replaces. The bag is shaped somewhat so that if you have it stuffed to capacity mostly with flexible items (i.e., extra layers, shell, etc...), it will place much of the weight close to your body. Mind you, this is not physics defying, but it is thoughtful and is different than its predecessor, the Flash UL, which being shaped like a flat-bottomed sack, allows the contents to sag away from your body moving the center of mass inches away from your spine and lower than on the Flash 18, pulling harder on your shoulders than is necessary for a given weight. Don't stuff either to capacity and the math on this is inconsequential. However, it is a bit of a teensy-weensy bag, so capacity is closer than not. Max that I have fit: 200 weight fleece quarter zip, 700 fill-power down vest, rain shell, fleece hat, 4x5x3 soft-sided first aid kit, 3-liter water bladder, sunscreen, bug dope, quart ziploc of trail mix, 2 Clif bars, sandwich, and the "box" (4" high, 5" diameter screw-on lid tupperware). It can totally fit in your main pack turned inside out and (per REI suggestion) used as a (big and slightly awkward) stuff sack, or just scrunched up into an unnoticeable ball. Full price (around 30 bucks) seemed a touch expensive for an unstructured sack, but I haven't found anything to compare it to given its light weight and crushability...due entirely to the fact that its unstructured. By the by, the ripstop material works. 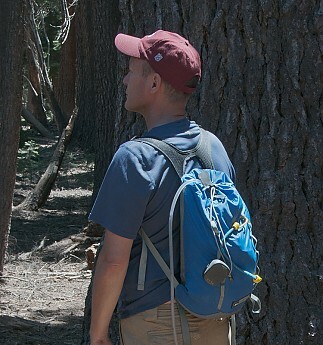 The Flash 18 is a great little pack for short day hikes or as a summit pack on a backpacking trip. While there are lighter options available, this is a great option in its price range. I wanted a way to go on day hikes from my camp while on backpacking trips without having to empty my main pack & schlepp it along. However I didn't want to add a lot of weight to my already-heavy pack. So I figured if I could find a light day pack that would serve double-duty as a stuff sack, then that would meet my needs. 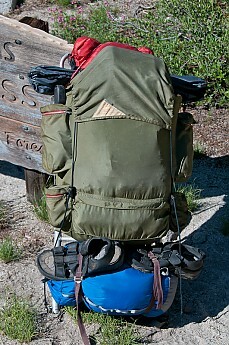 As it turns out, I use an old Kelty frame pack, and carry my sleeping back in a stuff sack lashed to the frame. This could work! I found the Flash 18 and it seemed like it would fit the bill. It happens to be just about the right size, both in width, and length, to serve this purpose. I line the Flash 18 with a plastic bag (see below) to protect the sleeping back against moisture. Then I stuff the sleeping back inside and lash it to the pack frame. It works out great. I'm 6'0" and the pack fits me just fine. Given that it's a small day pack, I only carry light loads in it (e.g. some extra clothing, a water bladder (3L will fit, but it bulges out, 2L would be better) and a snack). The pack's capacity is about right for this, but would be too small for much more. There's not a whole lot of organizational ability as it's a small single-compartment pack, with the exception of a sleeve for the water bladder. The comfort is fine — after all, it's very light. The shoulder straps are basic but functional. The waist strap is even more basic, but good enough for such a light pack (it's not designed to bear a load, but rather just stabilizes the pack). I've used this setup on several trips now and the pack has shown no signs of wear so far. My trips have all been in warm Sierra summer (or cool autumn), so I haven't taken it out in any rainy or snowy weather yet. BTW, I discovered a bag that's almost the perfect size to protect the Flash 18's contents from moisture. It's the 2.5 x 20" Loksak by Opsak. It's actually designed to be odor-proof so I suppose maybe if you seal it then you'd protect your lunch from hungry critters too :). The Loksak isn't quite long enough to seal though — but still provides a good amount of protection against light rain etc. I don't have any real gripes with the Flash 18. I'd prefer that it be lighter, and may someday splurge on one of the more expensive (but lighter) options. But for now this is working great. I guess the one thing I'd mention as a potential issue is that the fastener on the closure drawstring is really funky. I have gotten used to it, but the way it works isn't intuitive. And here's a shot of the Flash 18 being used as intended (as a day pack). Note the convenient loop fastener to which the SPOT transmitter is attached, and the tube for the water bladder coming out the top. 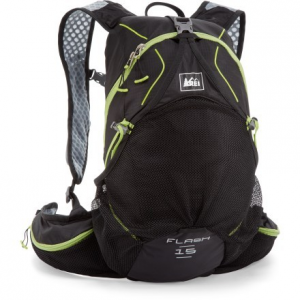 Perfect convertible pack for day hikes or ultralighting! 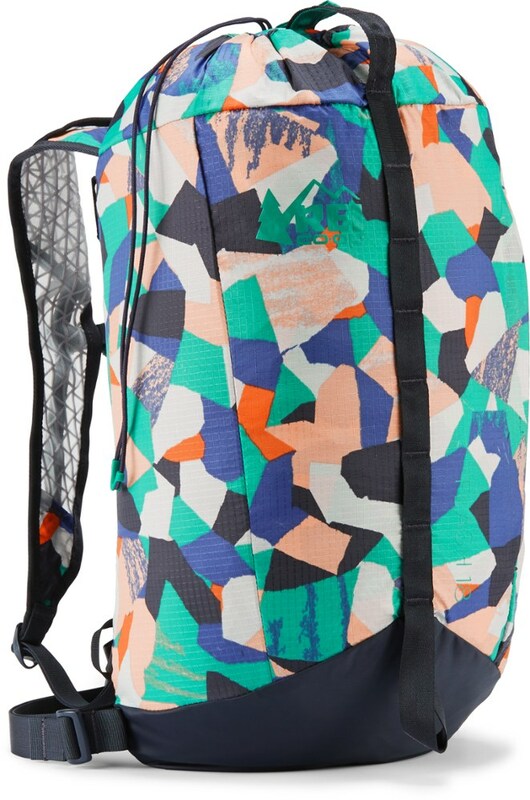 Day hikes, bike trips, or just needing a good stuff sack...this pack is perfect! It has a pocket specifically for a Camelbak or Platypus, to create a barrier to keep the rest of the pack dry. My mom has the older model, which has a few less features on the inside, but the one I purchased this season has an added couple of characteristics that the last one didn't have. There is now a key clip and an added mesh pocket (with zipper) inside the pack. The shoulder straps are a sturdy, but waffled and breathable material. The pack doesn't have a frame, so it is a great ultralight pack that can easily be used as a stuff sack if you flip it inside out. I have comfortably carried up to about 10lbs in it. This was an impulse buy while I was visiting an REI on the way to the mountains, and it has definitely paid off! I have used it several times this summer for dayhiking and summiting, and it gets the job done. In this pack I can carry: first aid kit, compass, camera, lunch, snacks, rain gear, water filter, 2 liter water bladder, 1 liter water bottle, and still have barely enough room to stuff my fleece jacket inside! The sternum strap and waist belt prevent it from sliding around on your back while climbing over boulders and uneven terrain. It weighs almost nothing, and can be wadded up and tossed anywhere in your big pack on the way to base camp. I would say that this little pack has certainly been worth the money. Super light for the price and very durable. New straps not as durable as originals. This pack is a convenient day and travel pack, which is obvious to most. That's why I'm going to talk about how it unexpectedly performed. What sets this pack apart for me is that it can be used for heavier loads. That's why I've used it for several winter hikes (with snowshoes and Microspikes strapped to it, and even once for a three-day/two-night stay at Zealand Falls hut (with a multi pack on my waist and a Zpacks multi pack on the daisy chain). Between the winter summits in the White Mountains and the fall journey to/from the hut as well as to the Bonds (30 miles in three days and plenty of elevation gain) I can say I had zero complaints with the pack and zero need for more space (especially after my snack and water levels reduced). It's fine for all sizes. The fit and ride are fine specifically with the sternum strap and waist secured, volume is great for a cheap/light pack, organizationally works well since you can only carry so much stuff in it, can be compressed by making use of the daisy chain and some exercise tubing (one of my 12 hiking essentials). Ease of use was perfect and I specifically loved that it had a drawstring instead of a zipper (failure point). I've owned this pack for about three years and it looks moderately weathered. I expect about eight years out of it. 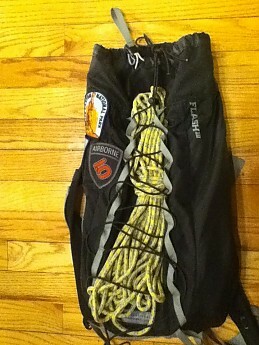 Sounds like you've done some nice winter hikes/climbs with this pack, Rob. Got any pictures of it from those trips you'd be willing to share in your review? The Flash 18 is a lightweight daypack when all you need to carry are items like water, snacks, and a few layers. It packs down to almost nothing and can be flipped inside out to be a stuff sack. When I'm traveling or backpacking, I often take this to use as a day pack. It also works well as a pack to wear while multi-pitch climbing. Lightweight: The pack is lightweight and compact. Rolled up, it's about the size of a hotdog. Hydration compatible: There is an internal sleeve for hydration and a hydration port. Shoulder straps, hip belt and sternum strap: The shoulder straps are comfortable and there's a webbing hipbelt and adjustable sternum strap. Interior storage: My pack has a couple of pockets for storage. The latest one has a zippered pocket which keeps keys and valuables secure. Recommended uses: Everything from day hikes to sightseeing to outdoor concerts. 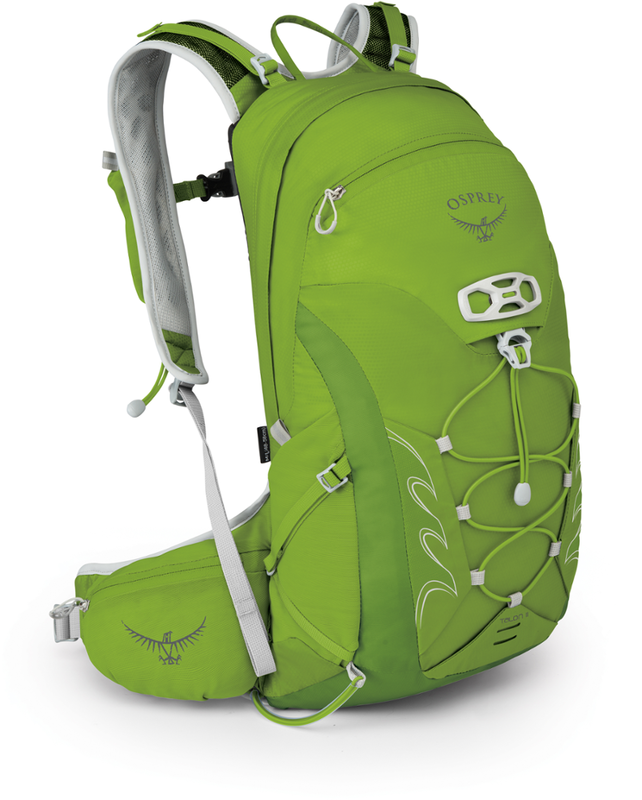 Great as a small multi-pitch climbing pack as well. Thanks for the review and pics, snigjs. I got my first one of these when they first came out and would still be using it if it hadn't been stolen out of my car. I use this constantly in and out of town. A full hydration bladder makes a great back panel to cushion your back from pokey things like crampons (inside a crampon bag of course) or stove and teapot. I would load this with gear for early morning/breakfast hikes. Survival kit, stove and teapot, extra layer for taking extended break to eat, and Z-rest pad sits it on. I used stretchy cord to make a bungee system running down the outside of the pack that was perfect for taking along my Z-Rest pad. I put my bear bag rope in it for the picture. I use it around town for bike commuting and with all the straps pulled right. The bungee adds compression in these situations. I also use it as a stuff sack for my sleeping bag on multiway trips. I've had to set up camp, put all water carriers in the Flash, and go back to the last water source and fill up. It keeps me from having to carry all that water and all my gear. Multi-functional item great for backpacks! OK, this is MORE than a "daypack." It is a stuffsack... then you use it as a dayback when you need to fetch water or do a dayhike on your backpacking trip. But, wait! There's more....the foam liner in the back of the pack comes out and functions as a nice little sit pad. Contains a water bladder holder and has the groovy little whistle-strap buckle combo. Comes in a huge selection of girly and boyly (is that a word?) 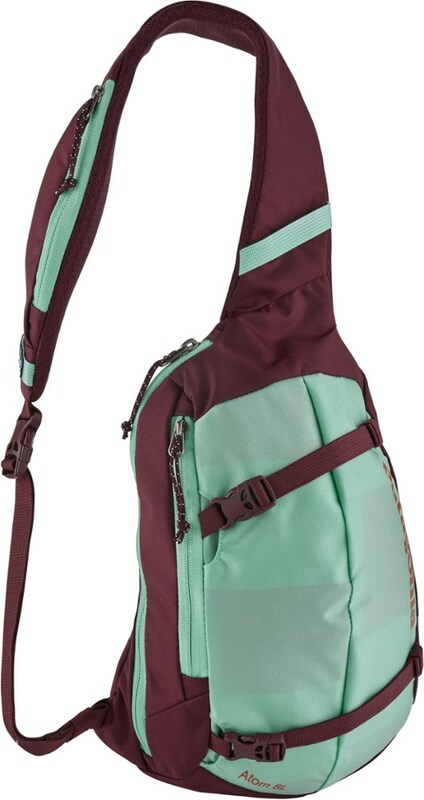 colors as well, and REI had this on sale for under $25. Oh, if you want to use it as just a daypack, it rocks for that, too. A true multipurpose item, but delicate. 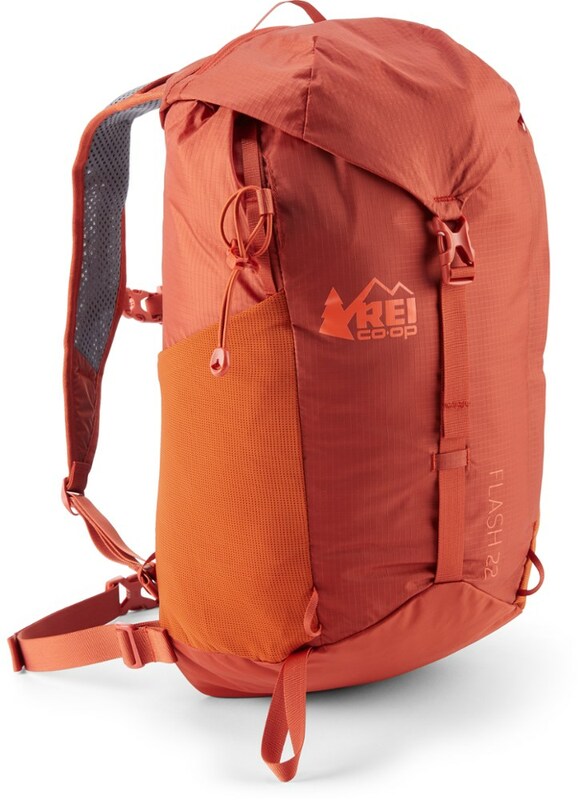 The Flash 18 is essentially a narrow, 18 liter stuff sack with a high quality set of shouler straps. Inside the bag at the top is a mesh zippered pocked that can hold a couple of wallets and a couple of cell phones. There is also a sleeve inside for a water reservoir. I have not used this feature for its intended purpose but if I do carry anything that could potentially be messy I just slide it into the sleeve. It also does have a thin foam backpanel which I think can be removed. The bag can be turned inside out and be used as a stuff sack. The fit of the pack is not a big issue unless you plan on overpacking. The straps are wide, flat, and comfortably curved and it has a sternum strap with an emergency whistle built into one of the buckles. The waist straps are a very simple 1 inch strap. There is no shaped hip belt or anything substantial. One of these buckles fell off already which is a pesky problem. I would say that the pack tends to fit higher up on the back rather than sit on the hips. This isn't really a concern since the loads with this pack are light, but you can adjust it to fit lower down if you'd like. The capacity of the pack is pretty good. I can get a camera, fleece, baseball hat, 3 bottles of water, camera, phone, wallet, and snacks into it when I take it to Disney world. I can get a change of clothes in it when i take it to the gym. I think you would have to be an extreme ultralighter to make this pack work for an overnight trip into the backcountry. The features of the pack are fairly basic: main compartment, zippered mesh pocket, drawstring closure, daisy chain, ice axe loop, coated nylon for weather resistance. The mesh pocket is located at the top of the bag. This is nice when you want to access or see the smaller items you are carrying. Its location also makes it a bit of a struggle to pull larger items out of the main compartment. The drawstring closure cinches down fairly well but you will still have a small opening. The closure mechanism takes a little getting used to and it does jam up about every fourth time i use it if I don't take care while cinching. The outer loop and chains are rather thin. I have read other reviews about this coming apart easily. I think that is probably a concern. The backpanel is not breathable and you will get sweaty carrying it in a warm climate. Love this pack as a day pack. This pack is very versatile, packable and easy to clean. 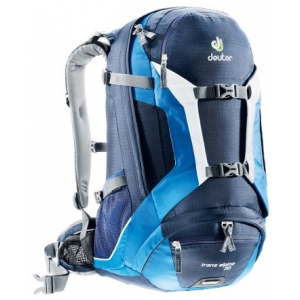 Great pack for day hikes or backpacking trip where you will have day hikes. It can double as a ditty bag but it is heavy if you only use it as a ditty bag. I use this pack for everything! The Flash Pack from REI is no more than a bag with a hydration sleeve. That's all you need for a day hike. I have been using the Flash Pack from REI since they came out. At $30 it is a bargain to lose about a pound compared to my Camelbak. I have an EMS Packable Pack 20L size which is comparable to the Flash. I agree with the reviwer, these types of packs are excellent for their low weight but fall short due to lack of a frame. I have used a cut down piece of foam from a blue camp pad to give the pack some structure plus you have a nice sit pad when taking a break. 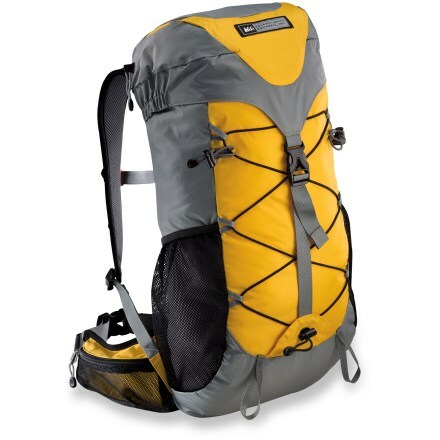 This is a great pack and is so compact that you can compress it into a small ball. I am a photographer, and wanted a pack that would carry my camera gear once I got to the campsite. I do not use a traditional camera bag as they are too heavy and are not good enough for overnight trips. After a lot of searching I settled on using Sterlite "Ultraseal" plastic boxes, which are watertight, and one is large enough for my DSLR while a smaller one was just right for lenses. They fit in my Deuter Futura Pro 42 (see my review on that if you want) bottom compartment perfectly. However, when I get to a spot that I want to photograph, I did not want to lug all my gear around. I needed a small bag to carry those Sterlite boxes, so enter the Flash18. I must say that this sweet young lady, at REI showed me the pack and she was right...it is perfect. Those Sterlite Ultraseal boxes fit PERFECTLY into the bag with room for a few other things. The tie system is a little strange at first, but once used to it,you can access your stuff quickly. It is so compact and light that I can stuff it into the Deuter, and pull it out when I need it. Perfect for when you want to leave your camp setup, and do a hike but need some way to bring something with. Very comfortable and easy to use! Great little daypack. Folds up small and can be folded up and tucked into a pocket on your backpack. Has hydration pocket. Perfect for dayhikes and hiking away from camp. For the money it's well worth it.